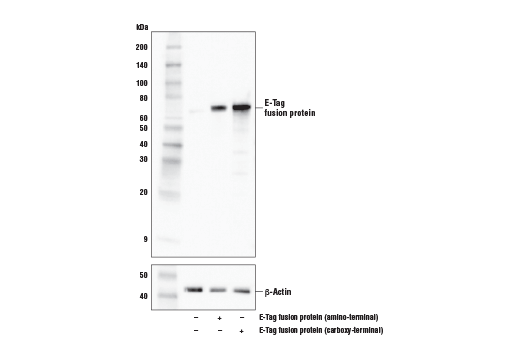 Western blot analysis of extracts from 293T cells, untransfected (-) or transfected with amino-terminal or carboxy-terminal E-tag fusion protein (+), using E-Tag (D1U2Q) Rabbit mAb (upper) and β-Actin (D6A8) Rabbit mAb #8457 (lower). Immunoprecipitation of transfected E-tag fusion protein from 293T cell extracts. Lane 1 is 10% input, lane 2 is Rabbit (DA1E) mAb IgG XP® Isotype Control #3900, and lane 3 is E-Tag (D1U2Q) Rabbit mAb. Western blot analysis was performed using E-Tag (D1U2Q) Rabbit mAb as the primary antibody and Mouse Anti-Rabbit IgG (Light-Chain Specific) (D4W3E) mAb (HRP Conjugate) #93702 as the secondary antibody. 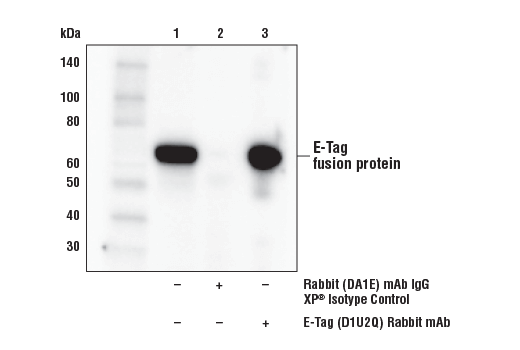 E-Tag (D1U2Q) Rabbit mAb recognizes transfected levels of recombinant proteins containing an E-tag. Monoclonal antibody is produced by immunizing animals with a synthetic E-tag peptide. Epitope tags are useful for the labeling and detection of proteins using immunoblotting, immunoprecipitation, and immunostaining techniques. Because of their small size, they are unlikely to affect the tagged protein’s biochemical properties. E-tag is an epitope tag composed of a 13 residue peptide. This peptide can be expressed and detected with the protein of interest as an amino-terminal or carboxy-terminal fusion (1,2). Leotoing, L. et al. (2011) J Biol Chem 286, 32277-88. Chen, T.T. et al. (2010) J Cell Biol 188, 595-609.